Home Costs > How Much Does a Bed Frame Cost? How Much Does a Bed Frame Cost? On average, a standard bed frame is going to cost anywhere from $35 to $160. A king-sized bed frame, for example, is going to cost anywhere from $59 to $160, while a full-size bed frame can cost $34 to $120. Take a look at our table below to see what most popular retailers charge for their bed frame. Adjustable, foldable bed frames can cost anywhere from $50 to $125. These bed frames can adjust to any bed size as well as fold up for easy storage. For example, a highly rated bed frame such as the STRUCTURES by Malouf retails for $50 to $9. Bed frames that come with drawers attached on the bottom can retail for $165 to as much as $550 depending on the quality of the bed frame set. The South Short Furniture Collection, for instance, has a platform bed with drawers that retails for $170 to $210. If you have an unlimited budget, the aquarium bed frame, which is a headboard with an aquarium inside, can retail for close to $12,000. Bed frames, like any other furniture, can come in all shapes and styles. The most common types can include metal or wood. Metal will often compliment a contemporary room, while wood can add “warmth” to a room. The materials will really come down to your personal preference and the flow of the room. All of your bed frames will come in various pieces and will have to be put together, again, just like other furniture you may purchase. Because of this, the frame won’t be easily moveable unless you disassemble it into tiny pieces. As the name states, this frame will be adjustable to fit any mattress style. Commonly made from metal, these frames will have supports on caster wheels, allow you to move it with easy. Once adjusted for your mattress, it will simply sit on top and will no longer be visible. Since bunk beds stack on top of each other, this will consist of two frames that stack on top of each other as well. Bunk beds can either have a twin on the top and twin on the bottom or twin on the top and a full on the bottom. A canopy bed will have longer posts on each corner and will be framed at the very top, allowing a canopy to surround the entire bed. The canopy, once installed, will have curtains on the side of the bed that allows you to enter, similar to a tent. A captain’s bed frame will have drawers underneath the mattress, taking advantage of the empty space. These frames are recommended for those who either want to take full advantage of an area or want to have dressers under the bed instead of nothing at all. This classic frame will have four posts on each corner and will be made of either wood or metal. These frames can be either a simple lackluster design or something extravagant that really makes the room pop. Known for its simple and clean look, a mission bed frame will have vertical wooden slats. This frame will be lower to the ground and will be designed so you don’t need to purchase a box spring. A sleigh bed will have a carved headboard, creating the appearance of a”sleigh,” similar to Santa Clause. Most will be made from a solid wood, but you can find some in metal as well. Of course, to complete the bed, a mattress is needed to be placed on top of the bed frame. Basic mattresses prices can start at $150. Shipping a bed frame may incur additional costs due to its size; however, this isn’t always the case as most online retailers today will waive this fee if you were to meet the spending minimum. For example, Amazon Prime has thousands of bed frames to choose from and each one can ship for free. Consider making your own bed frame for less than $15, as seen on Instructables. 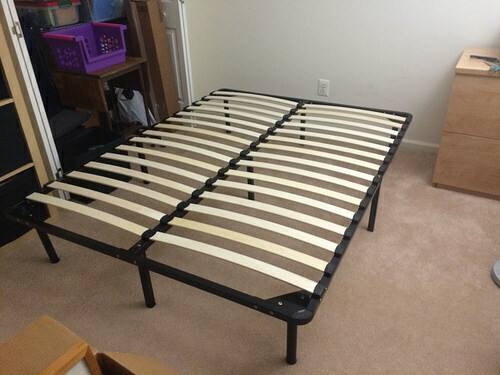 Used bed frames can almost always be found on Craigslist or local garage sales for pennies on the dollar. Consider checking out these sources to see if you can find a steal. Remember, a bed frame is completely optional. If you don’t mind sleeping as if you were on the floor and don’t mind having a certain “look” in your bedroom, then you may want to consider bypassing it if funds are tight. Visit a local furniture store or retailer to see if they have any bed frames on clearance.